A high quality touring jacket for high quality times! Zipper covered ventilation system allows air to flow through the inside of your coat while unzipped and with the removable liner taken out. Yet, when it's colder, keep those vents zipped and ride in comfort. Removable Zip Out liner will allow the wearer to enjoy all seasons in comfort. Made of selected leather hides with nickel hardware. On a motorcycle or off, this Black Drum Dyed Naked Cowhide jacket will protect you from the elements as well as improve your looks. Stand-up, European type collar. Features nickel hardware sewn inside leather flaps for a "not so bold" almost hidden, look. Shoulder trim for a broader looking upper body. Adjustable zippered sleeves, twin hand pockets, and inside pocket. Upper zippers cover the Air Flo System. Side laced for more adjustable comfort when riding or to pull into that trim figure. Clean and condition these leathers with leather balm. You may use snow seal, or mink oil to weather proof . Matching cream or wax polish can be used to enhance the color. Sizing on these coats tends to be small. Order a size larger than your chest measurement for a snug fit and two sizes larger for a more relaxed fit. 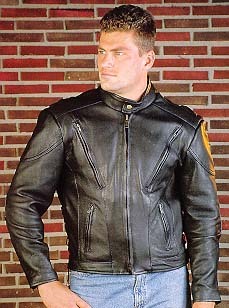 Style 305 is made of Drum Dyed Naked Cowhide... one of the highest quality leathers used for the leather coat industry. The coat will be substantial in thickness while remaining supple to feel. Although scars and blemishes are inherent in any leather, this Ultra Line will have fewer imperfections than the other leathers available from the imported MC fashions.